Almost a year ago I posted all of Graham Townsend's 1960s LPs on Rodeo Records' Banff label and those transfers proved themselves exceptionally popular. Although Graham recorded for many labels over the course of his astounding career, he remained associated with Rodeo Records his entire life. In fact, both his very first (Fiddling To Fortune, 1958) and last (Still Going Strong, 1997) studio albums were released by the company. 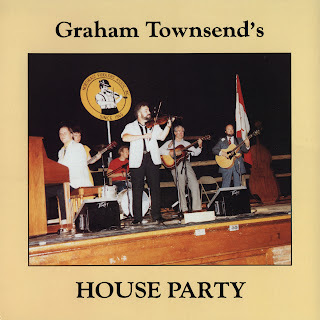 One of my personal favourites of all of Townsend's albums is this 1987 collection of tunes, "Graham Townsend's House Party" (Rodeo RLP 8015). Although the liner notes claim "In this recording you are blessed with an actual taping of a real live ‘house party’ (no studio, no canned sound effects)", the back cover also states that the recording was made at "NRS Productions, Rd #2, Waterbury, Vt.", so I believe this session was done in a studio, albeit a relaxed and informal one. Accompanying Graham are many of the same crew from he and Eleanor's 1981 "Live at Barre, Vermont" album; both seem to have been produced during the Townsend's appearances on behalf of Vermont's Northeast Fiddler's Association. However the recording came to be, it's a blessing that it did, as here are preserved sixteen great tunes played exquisitely by Graham with as good a backup band as he ever had, in excellent sound quality to boot! To me, this album epitomizes what good fiddle music is all about, where technical mastery meets incredible feel and melodic inventiveness. Enjoy! Graham guests on a 1993 episode of "Jubilee Years" here. Graham's first appearance on Don Messer's Jubilee is shown and he discusses the Messer show and his career.